Lt. Col. C.H. Green, 3RAR Commanding, in Slouch hat. 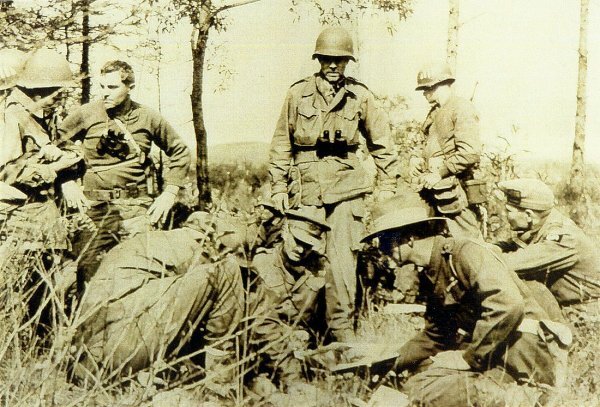 Americans (3/187 Regimental Combat Team) and Aussies (3RAR) and Brits meet up to plan the successful Aussie attack in support of the beleaguered American Airborne unit. This battle was one of the finest small-unit attacks on a position of ambush in the entire Korean War. 1 MX less 'C' Company who remained with 3 RAR moved through the Australians as the clearing operation progressed and formed a defensive position one and a half miles north of Sukchon for the night 22/23October "